From the legendary Carl Zeiss stable of Vario-Sonnar lenses, the DT 16-80mm is a class act that delivers a powerful 5x zoom range, equivalent to 24-120mm. The bland styling isn't much to look at, but the zoom and focus rings work smoothly. Autofocus is quite speedy, but a little shrill, and certainly louder than the systems on most other competing lenses. There's also no full-time manual focus override. 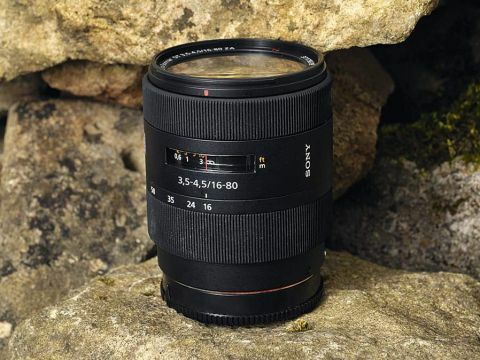 It's one of the most expensive lenses in the group, and the maximum aperture is fairly fast at f/3.5-4.5. Other attractions include the use of two glass moulded aspherical elements and Zeiss's T* optical coatings to counteract ghosting and flare. Despite looking and feeling like a fairly basic lens, the Sony optic really delivers where it matters most – in image quality. In our tests, it produced spectacular centre-sharpness throughout the zoom and aperture ranges, and sharpness was still excellent at the edges and corners of the frame. Distortion was also fairly low, apart from pronounced barrel distortion at the extreme 16mm end of the zoom range. Vignetting was disappointing, with very noticeable darkening in the corners. This occurred not only at the wide-angle end, but throughout the entire zoom range when shooting at maximum apertures. With its lack of advanced features, the Sony lens struggles to justify its price on image quality alone.